The Cullinan got its name from the largest diamond ever discovered and—as the most luxurious off-road vehicle and most technologically advanced Rolls-Royce in history—it seems fitting. Following the success of the Black Badge, the Cullinan appeals to a new generation of young elites who prefer to drive their own Rolls-Royces. 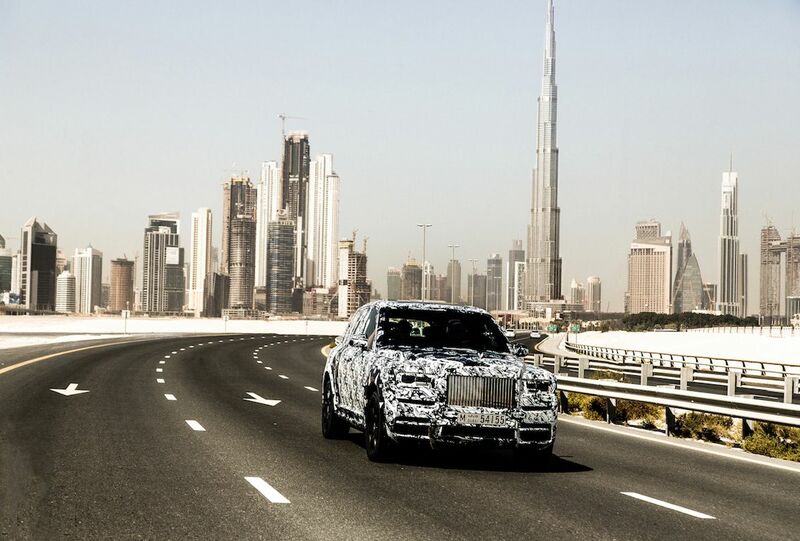 All SUVs are designed on the two-box genre, whereas the Cullinan is a three-box design built on the same aluminium architecture as the Phantom VIII. This all-terrain high-bodied vehicle makes it ideal for luxurious off-road travel anywhere on the planet. The 6.75 litre twin-turbo V12 Rolls-Royce engine delivers 563bhp/420kW and 850Nm/627lb ft of torque to the all-wheel drive and all-wheel steering system. The complete reworking of the engine delivers just the right level of torque (850Nm) at the lowest possible revolutions (1,600rpm). The Cullinan offers a suite of bespoke features developed to suit the diverse lifestyle needs of its owners. It features a rear passenger compartment which can be used as lounge seats or individual seats that are separated by a drinks cabinet complete with Rolls-Royce insignia whisky glasses and decanter, champagne flutes and of course, a refrigerator. From Night Vision and Vision Assist—including daytime and night-time Wildlife & Pedestrian warning—to its four-camera system with Panoramic View, Active Cruise Control, Collision Warning and Lane Change Warning, just to name a few. And this is just technology for the driver. The car is also super well-equipped for passenger comfort, with an industry leading 7x3 High-Resolution Head-Up Display, WiFi hotspot, and the latest navigation and entertainment systems. The Cullinan impresses off-roaders as well as on-roaders thanks to its light architecture and the latest generation of self-levelling air suspension.The all-new aluminium sub-structure delivers extraordinary car body stiffness for exceptional 'best-in-class' functional performance on rough terrain, whilst offering better comfort for passengers. The Spirit of Ecstasy controller rests on the central console with the 'Off-Road’ button, the 'Hill Descent Control' button and 'Air Suspension' height adjustment controls all within easy reach of the driver. Lastly, befitting the Cullinan's highest ride height, it delivers the deepest wading depth of any super-luxury SUV at 540mm.